A skip will be in the village from Friday the 8th March to Monday the 11th March. Dates for 2019 can be found here. Note that the skip is to be situated behind the fence not on the gravelled area in front of it. The shedule for bin collections for the year 2019/20 is now available. It can be found on the dates menu or by clicking here. At last you can order fibre broadband in the village. On using it for a few weeks now my speeds vary from 20Mb to 55Mb using online speed tests, in reality I can get up to 8.4Mb in file downloading and above this on streaming. I can watch sport online via BBC or SKY without buffering. The other weekend I had windows with Rugby, Football and Cricket all open and without any buffering. Speed still dips in the evenings but this is probably due to the server end not the connection. For those nearer the exchange speeds will be greater for those outside the village the speeds will reduce according to distance from the exchange. The new timetable started on the 9th December. There are no major changes just a minute either way on the current times. The new timetable will be available on the website link. If you want to check out the full timetable click here. Badminton restarted on the 8th January. Come and enjoy a social evening with the benefit of some exercise disguised as fun. No fees for residents of Barrhill and adjacent villages. For a plan of the proposed measures for Barrhill click here. For the 20mph policy document click here. The memorial hall is now fully open after the refurbishments. Village based clubs are being charged at only £5.00 per hour. Litter along the roadsides is an ongoing problem in and around the village. The Community Council has been negotiating with South Ayrshire Council about litter signs for almost 2 years now with still no end product. In a hope of improving the litter problem the CC has purchased litter pickers, gloves and bags which are available to anyone who is motivated enough to do some litter picking. and we will get the supplies needed to you. The weekly scheduled roadworks for SW Scotland is available in Excel spreadsheet format here. Note these are the TRANSERVE maintained roads so does not include the A714. I can only upload these when they are sent to me so occassionally a week goes missing. Services are held on the third Sunday of every month in the Memorial Hall. The next service will be at 3 pm on Sunday 17th March. Dates and details for Small Grants applications now available. The application form (in word format) is available here. The timetable for 2019 is available through the dates page. The Community Council would like to remind dog owners that "poop" bags are available free of charge from the village shop. Please be considerate to other members of the community and clean up after your dogs misdeeds. The use of "poop" bags has been successful in helping to keep the village clean but some people are still being inconsiderate in having very kindly bagged their dogs poop they have then just hung the bag in a nearby bush or tree. Being a generous soul I would like to think that they were put there with the intention of collecting them on the return journey of their walk rather than a deliberate act. Please dispose of "poop" bags in a hygienic and environmentaly friendly way. The link below is to Ayrshire Roads Alliance. On the site you can enter reports on road defects - that should keep you going until next months newsletter! Information about the proposed Arecleoch windfarm extension and the changed number and height of turbines. These are due at the end of the month. If you wish to stand as a member of the Community Council you need to send in your application form by the 21st February. Forms and pre-paid envelopes are available from Celia Strain or you can download the form here. A road closure will be put in place between Monday 4th Feb and Friday 9th February on the A714 between Shallochpark Roundabout and the B734 Barr road. The closure will be in place overnight between 2000 hrs and 0600 hrs each night to carry out lining works. The road will be closed only when signs are in place and the works are weather dependant. At last you can order fibre broadband in the village. I just ordered Superfast Plus from BT which is supposed to have a guaranteed minimum speed of 39Mb (but we will wait and see) and the cost was just £1 more than my current charge for what they claimed was 18Mb but in reality was less, OK in the morning but by the evening down to 2Mb or less. For those nearer the exchange speeds will be greater for those outside the village the speeds will reduce according todistance from the exchange. We do not have the 2019 dates as yet. Dates for 2018 can be found here. The shedule for bin collections for the year 2017/18 is now available. The next service will be at 3 pm on Sunday 17th February. 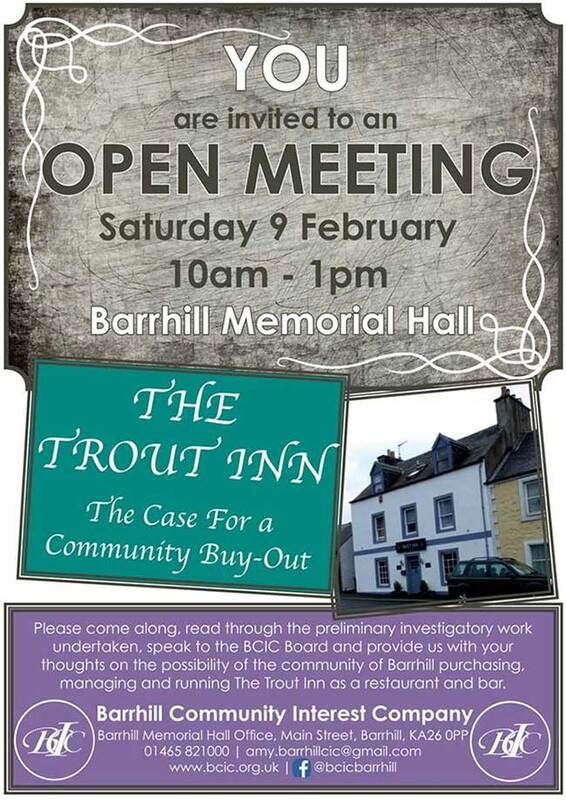 The Barrhill Community Interest Company currently has two vacancies. Due to the current progress of the works and the incoming inclement weather over the next week or so we have taken the decision to suspend the works until after the festive period. Our intention is to finish up on Friday 07th December at 15:30 and return to site on Thursday 3rd January until Sunday 6th January (working hours will be 08:00 – 17:00). The site will be left in a safe condition and regularly inspected between times. Badminton restarts on the 8th January. "If your area has fibre but your cabinet isn’t ready, you can't order fibre yet. We’re working on it though." The advice being given is to keep checking the website to find out when orders for fibre can be accepted. The next service will be at 3 pm on Sunday 20th January. Dates and details for Small Grants applications for October & november 2018 is now available.